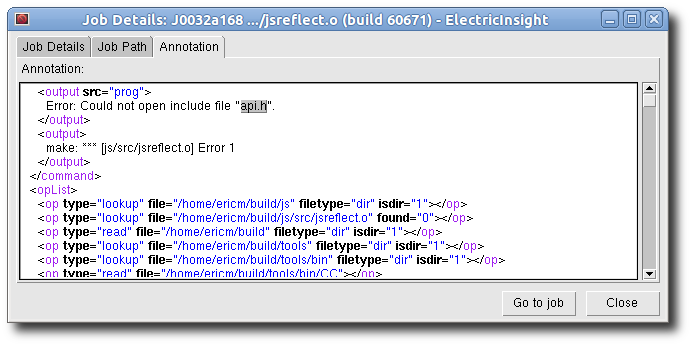 Often when analyzing builds executed with ElectricMake, all the information you need is in the annotation file — an easily digested XML file containing data such as the relationships between the jobs, the commands run, and the timing of each job. But sometimes you need more detail, and that’s where the emake debug log comes in. DISCLAIMER: emake debug logs are intended for use by Electric Cloud engineering and support staff. Debug logging contents and availability are subject to change in any release, for any or no reason. Enter at your own risk, your mileage may vary, etc. etc. The information in this article refers to ElectricAccelerator 6.0. Agent allocation logging provides detailed information about emake’s attempts to procure agents from the cluster manager during the build. If you think emake may be stalled trying to acquire agents, allocation logging will help to understand what’s happening. Cache logging records details about the filesystem cache used by emake to accelerate parse jobs in cluster builds. For example, it logs when a directory’s contents are added to the cache, and the result of lookups in the cache. Since it is only used during remote parse jobs, you’ll have to use it with the ––emake-rdebug=value option. Use cache logging if you suspect a problem with the cached local filesystem. Environment logging augments node logging with a dump of the entire environment block for every job as it is sent to an agent. Normally this is omitted because it’s quite verbose (could be as much as 32KB per job). Usually you’re better off using env-level annotation, which is more compact and easier to parse. Filesystem logging records numerous details about emake’s interaction with its versioned filesystem data structure. In particular, it logs every time that emake looks up a file (when doing up-to-date checks, for example), and it logs every update to the versioned file system caused by file usage during the build’s execution. This level of logging is very verbose, so you shouldn’t enable it as a general rule. It’s most often used when diagnosing issues related to the versioned filesystem and conflicts. History logging prints messages related to the data tracked in the emake history file — both filesystem dependencies and autodep information. When history logging is enabled, emake will print a message every time a dependency is added to the history file, and it will print information about the files checked during up-to-date checks based on autodep data. Enable history logging if you suspect a problem with autodep behavior. Job logging prints minimal messages related to the creation and execution of jobs. For each job you’ll see a message when it starts running, when it finishes running, and when emake checks the job for conflicts. If there is a conflict in the job, you’ll see a message about that too. If you just want a general overview of how the build is progressing, j-level logging is a good choice. emake uses a generated parser to process portions of nmake makefiles. Lexer debug logging enables the debug logging in that generated code. This is generally not useful to end users as it is too low-level. Ledger debug logging prints information about build decisions based on data in the ledger file, as well as updates made to the ledger file. Enable it if you believe the ledger is not functioning correctly. When memory logging is enabled, emake will print memory usage metrics to the debug log once per second. This includes the total process memory usage as well as current and peak memory usage grouped into several “buckets” corresponding to various types of data in emake. For example, the “Operation” bucket indicates the amount of memory used to store file operations; the “Variable” bucket is the amount of memory used for makefile variables. This is most useful when you are experiencing an out-of-memory failure in emake, as it can provide guidance as to how memory is being utilitized during the build, and how quickly it is growing. Node logging prints detailed information about all messages between emake and the agents, including filesystem data and commands executed. Together with job logging, this can give a very comprehensive picture of the behavior of a build. However, node logging is extremely verbose, so you should enable it only when you are chasing a specific problem. When parse output logging is enabled, emake will preserve the raw result of parsing a makefile. The result is a binary file containing information about all the targets, rules, dependencies and variables extracted from makefiles read during a parse job. This can be useful when investigating parser incompatibility issues and scheduling issues (for example, if a rule is not being scheduled for execution when you expect). Note that this debug level only makes sense when parsing, which means you have to specify it in the ––emake-rdebug option. The parse results will be saved in the ––emake-rlogdir directory, named as parse_jobid.out. Note that the directory may be on the local disk of the remote nodes, depending on the value you specify! Parse debug logging prints extremely detailed information about the reading and interpretation of makefiles during a parse job. This is most useful when investigating parser compatibility issues. This output is very verbose, so you should only enable this when pursuing a specific problem. Note that like parse output logging, this debug level only makes sense during parsing, which means you have to specify it in the ––emake-rdebug option. The parse log files will be saved in the ––emake-rlogdir directory, named as parse_jobid.dlog. Note that the directory may be on the local disk of the remote nodes, depending on the value you specify! Parse relocation logging prints low-level information about the process of transmitting parse result data to emake at the end of a parse job. It’s only used internally when we are extending the parse result format, and so is unlikely to be of interest to end users. Subbuild logging prints details about decisions made while using the emake subbuild feature. You should enable it if you believe that the subbuild feature is not working correctly. Authentication logging is a subset of node logging that prints only those messages related to authenticating emake to agents and vice-versa. If you are having problems using the authentication feature, you should enable this debug level.